I love this simple fruit dessert for Christmas. 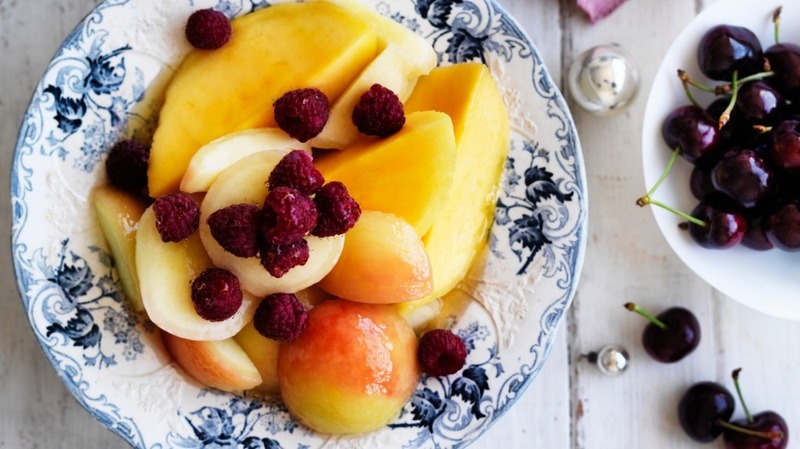 It's all about what is best in December, when we are blessed with an abundance of sweet and delicious summer fruits. Use a quality wine for the sauternes cream. If you're using an Australian sweet wine, something like De Bortoli Noble One Botrytis Semillon will give a great result. In a bowl, mix the fruit, sprinkle with 50g castor sugar, then macerate for an hour. For sauternes cream, combine wine, orange juice and peel in a container. Cover and set aside for 1 hour to infuse. Strain and discard peel. Add 125g castor sugar to wine mixture and stir to dissolve. Add cream and whisk to soft peaks. Spoon the fruit into bowls, top with sauternes cream, and serve immediately.